Nintendo Denies Wii U "Accidental Hack"
Nintendo says a Wii U "debug menu" discovered by a NeoGAF user was actually just a mock-up. 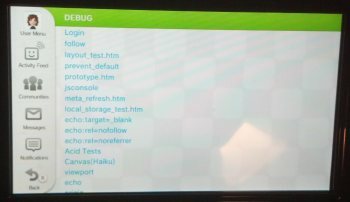 A NeoGAF user reported yesterday his rather surprising discovery of what appeared to be a "debug menu" in his newly-acquired Wii U console, which he stumbled upon while "messing around in Miiverse." He didn't take advantage of the many dangerous options it laid out before him, like flagging content as prohibited or deleting admins, because he didn't want to be banned on launch day, but his announcement naturally left a lot of people worried about the potential security holes in Nintendo's online world. It turns out that there's no need to be concerned, however, as Nintendo says there was never any actual security breach to begin with. "It has come to our attention that some people were able to access a mock up menu on Miiverse following the launch of Wii U in the U.S.," the company said in a statement. "Please note that this was only a mock up menu and has now been removed and is not accessible." The company did not address the question of why games like Metal Gear Solid, Yoshi's Land and Soul Hackers appeared in the mock-up menus, even though they have not been announced for the Wii U.